Can you tell who is who by looking at the picture? I barely can. NINA DOBREV (left) looks a lot like Victoria Justice (right). Could they be separated at birth? Well, no. There is a pretty striking resemblance in that they’re both brunette, gorgeous, and they both have a similar smile look. Stunning isn’t it? 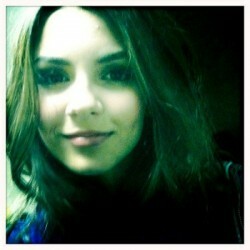 Victoria Justice recently posted this new photo of herself on her twitter using her iPhone. I know right? She almost looks like Nina herself. It took me several minutes to finally realize it wasn’t Nina but none other than the teenage star who plays in Nickelodeon’s Victorious (Victoria Justice). So, do you think Victoria is Nina’s doppelganger? Leave your thoughts below, peeps! Where you know her from? Nina Dobrev is a Bulgarian-Canadian actress. She played the role of Mia Jones, the single teenage mother on Degrassi: The Next Generation, from the show's sixth to ninth season. She currently stars as Elena Gilbert and Katherine Pierce on The CW television teen drama The Vampire Diaries.